And then, when we reach our paddling destinations, we could cruise back in style, to pick up your truck and my car, back at the starting spots. Much simpler and easier transportation. We might meet good-looking adventurous women if we had a Harley. And, in Michigan nowadays, we would not even have to wear helmets! Please buy me a motorcycle. No. No motorcycle. Our parents were smart enough to say “No!” when I went through my motorcycle phase. By the time I could afford to buy and maintain a motorcycle on my own I had other, less dangerous passions. So, where have we been . . . It was a cold Spring with lots of rain. We considered going out early – remember, we were on the river as late as December 1 – but listened to more experienced paddlers who told us the river wasn’t safe. Then our mother began a rapid decline. Tom and our sister care for Mom almost daily, I get over to the west side of the state as often as I can. I don’t think we’ll get out again until Mom has crossed her final river. That will be soon and is not tragic. She would be 93 if she made it to her August birthday – she won’t – and has had a remarkable life. Go with God, Mom. We love you and are blessed to have been able to tell you that on countless occasions over the past year. The reason we take such good care of you is because you took such good care of us. And, should you regain your connection to this world for a day or two, please tell Tom he can’t have a motorcycle; ok? I found a campground that looks pretty cool along the Maple River, a tributary of the Grand. I’m thinking it would be fun to rent a cabin – hell, we might even pitch a tent – at the Maple River Campground and then canoe from there down the Maple to where it empties into the Grand near the village of Muir and Lyons. Does anyone have any experience canoeing the Maple in this area? We’d love to hear from you. Briefly Political . . . I often conclude a post by writing, “Always take the river’s side; Industry and Big Agriculture have plenty of friends already.” If you think I am being overly-dramatic, consider this: EPA Administrator Scott Pruitt attended a University of Kentucky basketball game in December, sitting in courtside seats provided by a coal industry magnate who was seeking to have Obama-era regulations on the coal industry reversed. That is not draining the swamp, that is importing the swamp. Of course the source I cite is the New York Times, so it’s likely to be fake news. Oy (as my brother would say)! 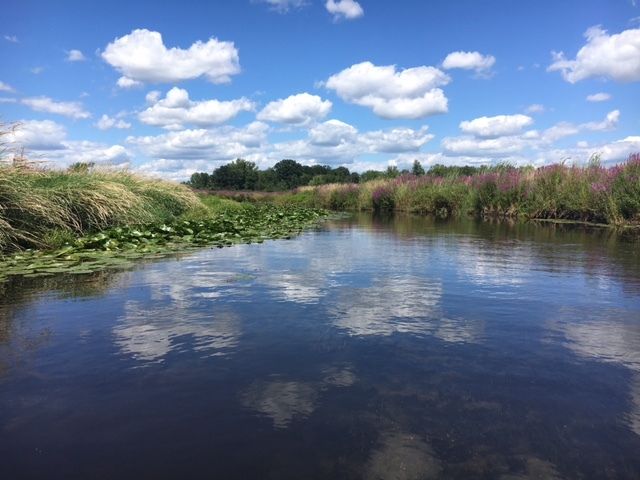 This entry was posted in Environment, Michigan, nature, rivers and tagged birds, Lyons, Maple River, Maple River Campground, motorcycles, Muir, sandhill cranes, woodpeckers. Bookmark the permalink. You know, my brother would try to my is Chevy duels in my canoe if he thought it would be a great ride through hell on Halloween. I have to go with Mom on this one as Mom’s stick together. No motorcycle TOM!!!!! Darn things are to loud and you can’t hear the crickets chirping on your hitching trip back up River. I will support your cause. That guy out of Oklahoma was really out of his flipping mind!!!! Well let’s face it most at the top in our government don’t care a flip about our natural spaces. Let’s form a demonstration!!! My mom was from the 60’s generation and I would be proud to protest in honor of this cause. Peace and love to your mom. Hope my kids will also have such a loving tribute one day. Way to go guys. Tent!